Our original handmade Cheese pizza is made from all natural ingredients, with no preservatives ever added. Mystic Pizza dough is prepared with care and topped with our original with our original recipe “secret” sauce. 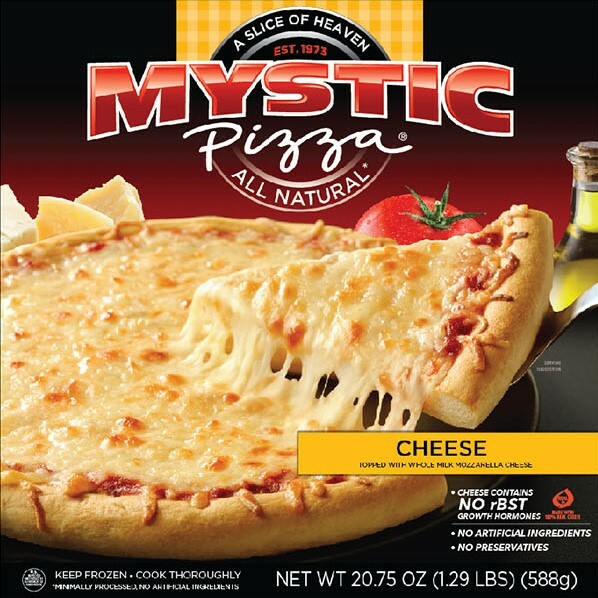 Sprinkled with a whole milk mozzarella cheese blend and you are on your way to enjoying a famous “Slice of Heaven®” Mystic Pizza. INGREDIENTS: CRUST: Wheat Flour, Water, Corn Oil, Yeast, Sugar, Salt, Baking Powder (Cream of Tartar, Sodium Bicarbonate), SAUCE: Water, Fresh Vine-Ripened Crushed Tomatoes, Sugar, Seasoning (Dehydrated Garlic, Spices, Dehydrated Onion), Salt, Romano Cheese (Pasteurized Sheep’s Milk, Cheese Cultures, Salt, Enzymes, and Powdered Cellulose [Anti-Caking Agent]), Basil, CHEESE: Whole Milk Mozzarella Cheese (Pasteurized Milk, Cheese Cultures, Salt, Enzymes), White Cheddar Cheese (Pasteurized Milk, Cheese Cultures, Salt, Enzymes).